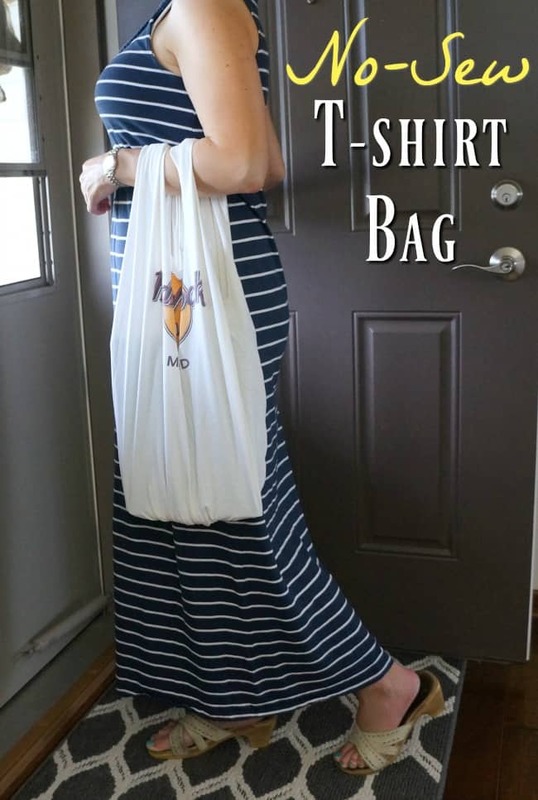 An easy no sew t-shirt bag, use this tutorial to upcycle a favorite old t-shirt into a one of a kind functional bag. I have a stack of old t-shirts I’ve collected over the years and just haven’t had the heart to get rid of. I have most of my college sorority shirts, high school state competition shirts, and a few from some very special trips. 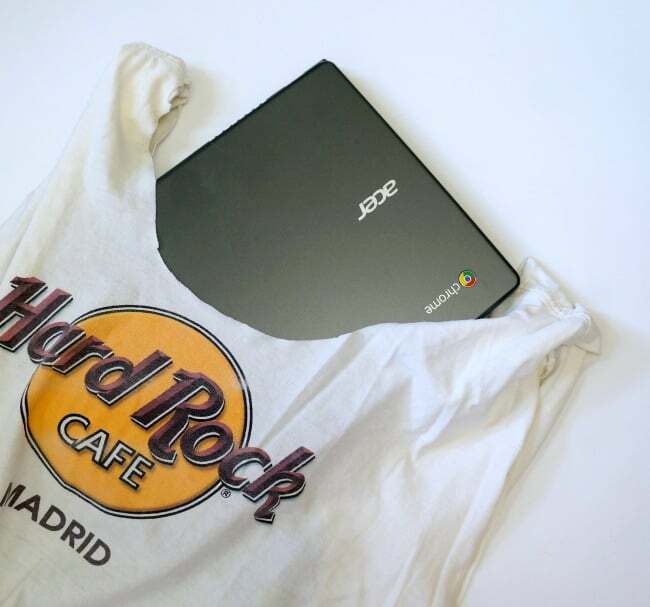 In that pile is a t-shirt from the Hard Rock Cafe in Madrid, a shirt I bought on a class trip almost 20 years ago. 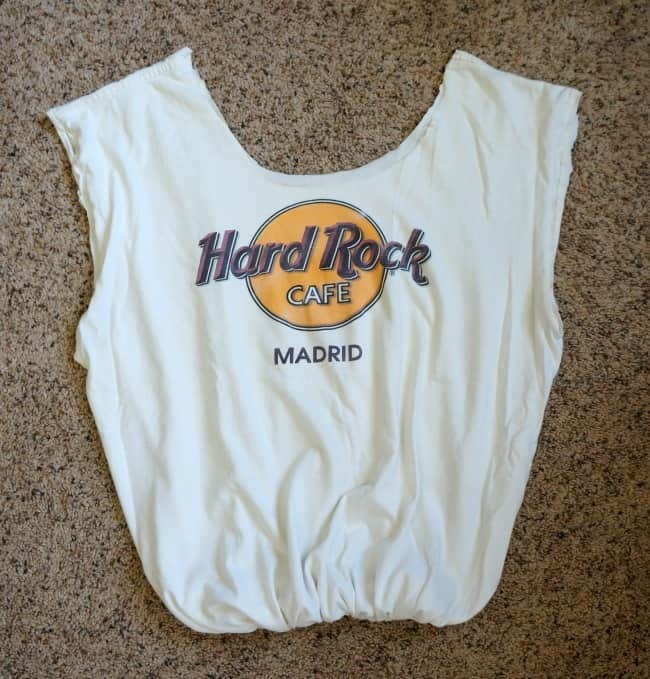 It doesn’t fit quite right anymore but I have so many amazing memories from that trip I can’t bring myself to get rid of this gem. So I upcycled it into this cute t-shirt bag! I have seen bags like this all over the internet, they are pretty easy and straight forward to make. Now that I have made this one both my kids want one of their own so we will be digging through that t-shirt pile again to make more bags. 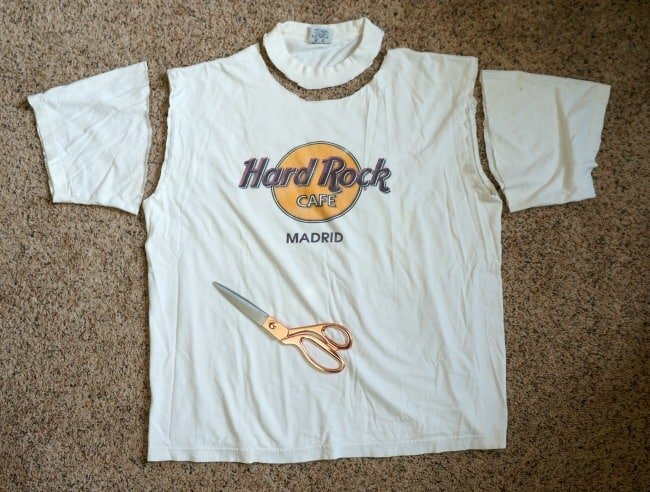 I started by laying my t-shirt flat on the ground and cutting off the sleeves and collar. What’s left will make the handles so you can adjust the depth of your cut accordingly. 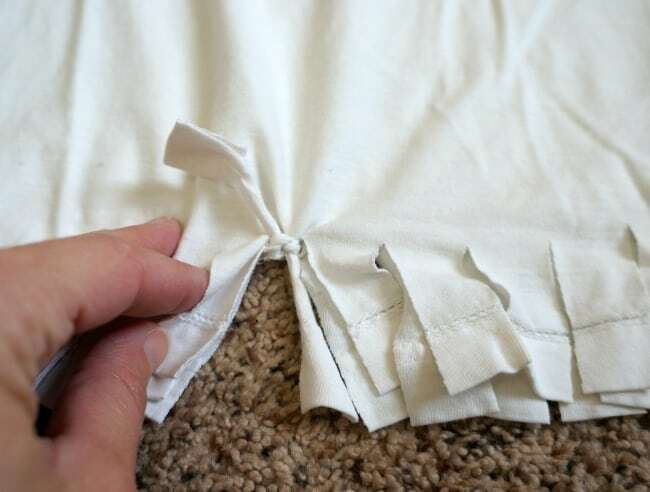 A deeper cut along the collar will result in a larger opening. 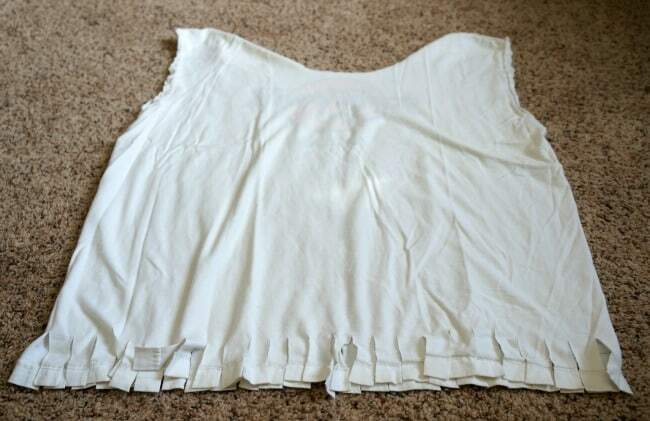 Next, I cut fringe on the bottom of the shirt. I cut slits through the front and back about 1.5 inches long spaces about a half inch apart. Then I turned the shirt inside out. I tied the front and back together, double knotting as I moved along. This will serve at the bottom of the bag so make sure the knots are secure. That’s it! I turned the shirt right side out and my bag was finished. 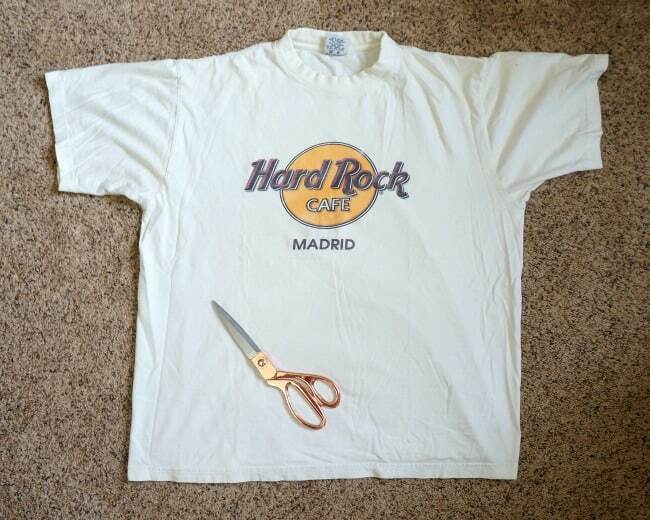 To curl the cut edges along the arms and collar I stretched the shirt a bit. The curling covered any uneven cut lines. This is a super functional bag that I am keeping in my car. Great for a shopping bag in a pinch or a functional tote on the go. 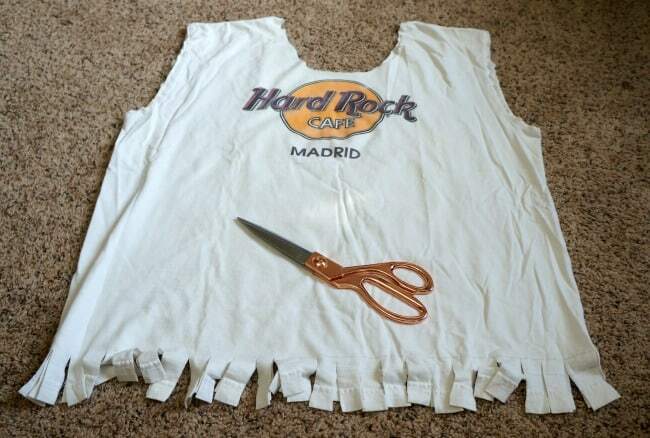 What t-shirt would you upcycle? This shirt bag is so cute! It looks so easy to make too. I will have to make one soon! What a fun project! What a perfect recycle! useful and still holding your memories (get it…holding???) Anyway, I love that your project doesn’t need to be sewed at all!